Description: During a site visit to the aging New Hampshire State Mental Hospital in Concord, New Hampshire approximately ten years ago, state environmental officials encountered a mercury-based fire alarm system. 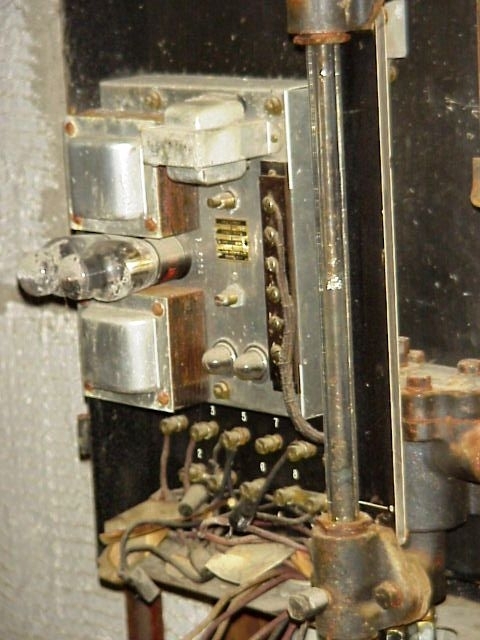 Each of the ceilings in the rooms had a sensor that was a small metal air-filled bulb or diaphragm, each connected by 1/8 inch brass tubing to a small (1" x 2" x 4"), sealed, mercury reservoir in the basement. Each reservoir had approximately a half teaspoon of elemental mercury. 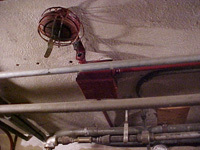 Individual reservoir tubes were grouped into wall-mounted manifolds in the basement. 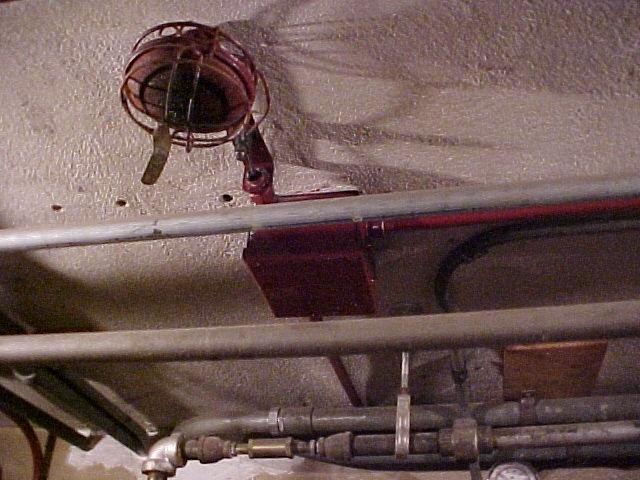 The building's original fire alarm system was built in 1932 and was upgraded in the 1950"s or 1960"s with the replacement of some of the old metal manifolds with plexiglass manifolds. There were 800 rooms in the facility and about eight rooms worth of detectors were attached to a single mercury tube in the basement. The New Hampshire Department of Environmental Services (NH DES) estimated there were about 20-30 pounds of mercury in the entire system. Purpose of the Mercury: When a fire heats the room, air in the sensor bulb attached to the ceiling would expand, creating a positive air pressure that "traveled" down the brass tube into the basement where it displaced the mercury in the reservoir until it covered two electrodes, thus completing a circuit and setting off the fire alarm. An appealing feature of this system was that it did not require electricity to be wired into each room's detector as modern room alarms require. Potential Hazards: Unfortunately, the fire alarm system discovered in this building tended to leak, and the maintenance person had approximately 100 pounds of mercury in pint jars he used to keep the system "topped off." There were numerous mercury beads on the floor and in the manifold. The mercury vapor emitted could potentially exceed safe indoor air levels. Persons that potentially have been exposed to mercury vapor should contact their state environmental agency or public health department. Persons should contact their state environmental agency for instructions on proper clean-up and disposal of spilled mercury, as well as any mercury stored in jars onsite. Recycling/Disposal: The mercury contained in the reservoir and stored in the pint jars needed to be disposed of as hazardous waste and sent to a mercury recycler. Any materials used to clean up spilled mercury beads or any items or pieces of equipment that are contaminated with mercury would also need to be disposed of as hazardous waste. 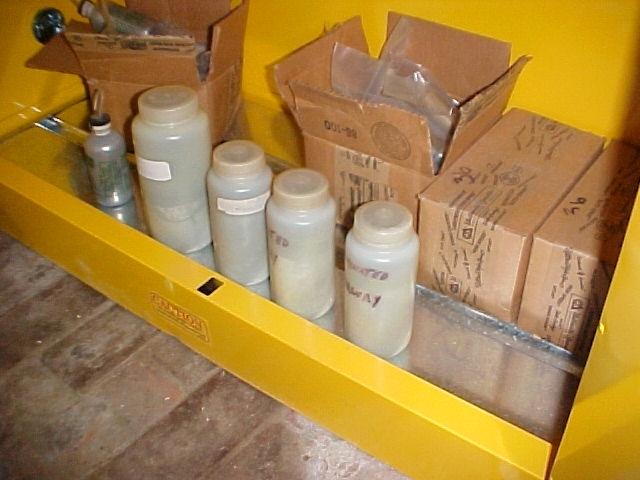 In this particular case, the mercury had amalgamated with the brass tubing over the many years it was in use, rendering the entire tubing and manifold system RCRA hazardous waste. The hospital had hoped to sell the copper for scrap value and instead had to spend thousands of dollars for proper hazardous waste disposal. Statutes and Other Information: The manufacturers of the fire alarm equipment found in this building were identified as Central Automatic Sprinkler Co. (Pennsylvania) and Automatic Sprinkler Corp. of America (Ohio). Research indicates that mercury is no longer used for this particular type of application in fire alarm systems. Note: modern fire alarm systems may contain a mercury switch. 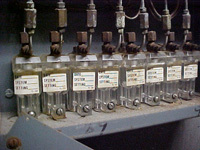 Mercury switches are among the mercury-containing products being "phased-out" in many states, including California, Connecticut, Illinois, Louisiana, Maine, Massachusetts, Minnesota, New Hampshire, New York, Rhode Island, and Vermont. Therefore, fire alarm systems containing a mercury switch may be subject to sales prohibitions and/or other requirements (e.g., product sales notification, labeling requirements, collection plans) in these states. Description: The 3M Tartan? track flooring and other synthetic rubber-like gym floors (originally marketed by other manufacturers as "Chemturf" or "Tartan") may contain mercury. The 3M Tartan? floor covering is a solid, rubber-like polymer floor covering that was developed in the 1960's. 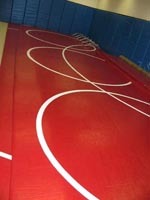 It was promoted as a substitute for wood flooring in gymnasiums and as a durable running surface for both indoor and outdoor track and field facilities. This flooring was used widely in the U.S. in public buildings, schools, and gymnasiums throughout the early 1970"s and 1980"s before it was discontinued in 1985. Note: several other manufacturers may have adopted the term "Tartan" in marketing similar athletic flooring materials. Therefore, "Tartan" may have developed as a generic term for this type of flooring and may not be necessarily be associated with 3M or contain mercury. Purpose of the Mercury: The mercury was incorporated into the formulation of these products and used as a catalyst when mixing the polymer to form the floor covering. According to 3M, the finished product typically contained 0.1-0.2 percent mercury. Potential Hazards: These floors are capable of emitting mercury vapors. In some instances, the floors were shown to release mercury vapor above the recommended Agency for Toxic Substances and Disease Registry (ATSDR) level. 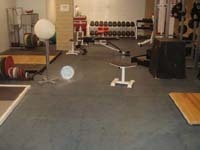 Items that have been in contact with these floors for long periods of time may also emit mercury vapor (e.g., sports equipment, gym mats). After testing gym flooring in Michigan and Ohio schools, the states' health agencies and ASTDR concluded that the levels of mercury in the air were safe for routine use. However, any damage to the flooring and normal aging may lead to increased releases of mercury. Removal or other major disturbance of the flooring can produce high levels of mercury vapor in air. Recycling/Disposal: The mercury content of this flooring varies, as does the amount of degradation that occurs over time, and, therefore, the extent to which mercury can be leached from the flooring. In some cases, this flooring must be treated as hazardous waste because it will fail the RCRA Toxicity Characteristic Leaching Procedure (TCLP), which is a test used to determine if the material must be managed as a hazardous waste. If the test results exceed the TCLP standard for mercury, the flooring material must be disposed of as hazardous waste. Statutes and Other Information: The 3M Tartan? flooring was discontinued before 1985. The process has since been perfected without the use of mercury, and there are currently many companies in the all-weather track industry that manufacture synthetic gym flooring without mercury. Description: Some commercial hot water heaters, 100 gallons or larger, include a mercury-containing thermocouple (also known as a mercury flame sensor or thermostat probe). These water heaters are used in a variety of applications, including car washes, hospitals, restaurants, schools, and other commercial facilities. Residential gas-fired water heaters do not contain mercury. The mercury thermocouple is located on the burner and contains approximately 1-2 grams of mercury. In this type of application, the probe is in the water that is being heated and is not directly in contact with any flame. Purpose of the Mercury: A mercury thermocouple is part of the main temperature-controlling gas valve. The mercury expands when it is heated or contracts when it is cooled, opening and shutting the valve, respectively. If the pilot light goes out, the mercury cools, contracts, and closes the diaphragm, automatically shutting off the gas supply to the pilot. This safety feature keeps gas from escaping into the building and causing an explosion. Potential Hazards: Service technicians removing the thermocouple or flame sensor should be careful not to break the device because doing so may result in a mercury leak or spill. If a spill or break occurs, persons should immediately contact their state environmental agency for instructions on proper clean-up and disposal. They should also contact their public health department or poison control center if they have been exposed to the mercury. 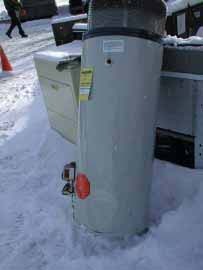 Recycling/Disposal: Because large appliances, such as hot water heaters, often have market value as scrap metal, the water heater itself may be recycled and reused as long as the hazardous components, including the mercury thermocouple, are removed. Local appliance recyclers and scrap metal yards may also collect these items for scrap metal recycling purposes. They should be able to safely remove the mercury thermocouple before shredding the larger component. The mercury thermocouple should be sent to a reclamation facility and recycled. Properly recycle or dispose of the mercury thermocouple (in-tact). Statutes and Other Information: The Holyoke solid waste transfer station in Massachusetts participated in the Franklin County Solid Waste Management District "Mercury Switches in Appliances Study" in 2000-2001. During this study, the facility identified four commercial water heaters that contained mercury. These were older models that had been manufactured by GE and Rheem. Research indicates these companies no longer manufacturer hot water heaters that use a mercury thermocouple or flame sensor. Other manufacturers of commercial gas-fired hot water heaters have reported that they have not used a mercury thermocouple for this application in more than 15 years. Many of the commercial gas water heaters currently manufactured have an electronic spark ignition that reacts when the temperature control reaches a low point (i.e., electronic sensor). There are some manufacturers of hot water heaters that still manufacturer lower cost 80-100 gallon units that use a standing pilot ? it is unclear whether these models still use mercury. The Vermont Agency of Natural Resources (VT ANR) has been compiling mercury-added product labeling plans since 1999 and has not identified any manufacturers that utilize mercury in their flame sensors for hot water heaters. Description: Pool heaters circulate water through heat exchangers that are heated by a burner, some of which are gas-fired. They are commonly used in indoor and outdoor spas and portable hot tubs (e.g., Jacuzzi) because of their ability to heat the water quickly. In a 2001 study of mercury switches in appliances, the Franklin County Solid Waste Management District in Massachusetts identified the TelStar? gas-fired pool heaters as having a mercury flame sensor inside the heater. The mercury flame sensor was located on the burner and contained approximately 2 grams of mercury. Purpose of the Mercury: Gas heaters get their energy from either propane or natural gas, similar to household hot water heaters. Unlike a hot water heater, the gas-fired pool or spa heater has no reservoir to hold water; it is a "flow through system" that heats the water as it passes through a manifold heated by the pilot flame. The mercury expands when it is heated or contracts when it is cooled, opening and shutting the gas valve, respectively. Therefore, the mercury flame sensor is used as a safety device, shutting off the gas supply automatically if the pilot flame goes out. Potential Hazards: Service technicians removing the mercury flame sensor should be careful not to break the device because doing so may result in a mercury leak or spill. If a spill or break occurs, persons should immediately contact their state environmental agency for instructions on proper clean-up and disposal. Persons that have been exposed to a mercury spill should contact the public health department or poison control center. Recycling/Disposal: Because large appliances often have market value as scrap metal, the pool heater may be recycled and reused as long as the hazardous components, including the mercury flame sensor are removed. Local appliance recyclers and scrap metal yards may collect these items for scrap metal recycling purposes. They should be able to safely remove the flame sensor before shredding the larger component. 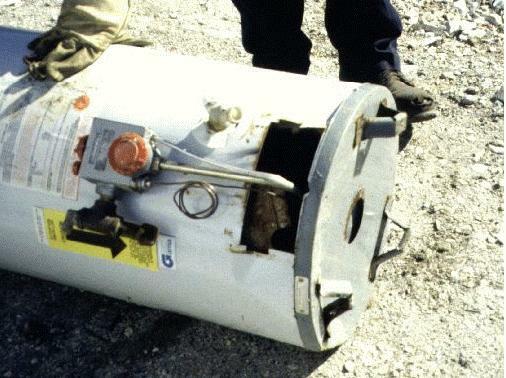 The mercury flame sensor should be sent to a reclamation facility and recycled. Statutes and Other Information: Research indicates that the TelStar? pool heater was manufactured by Teledyne Laars from 1985 to 1999. It is no longer in production or available for sale. Most spas and pools currently on the market use electric pool heaters; some use solar energy. Description: A few years ago, the New York State Department of Health (NYS DOH) responded to a mercury spill at a high school. The spill was discovered in a closet during a routine asbestos inspection but had probably occurred earlier when the closet had been used to store janitorial equipment. The source of the mercury spill was a steam heat controller. The NYS DOH discovered approximately six steam heating system units in various closets and utility rooms throughout the school. 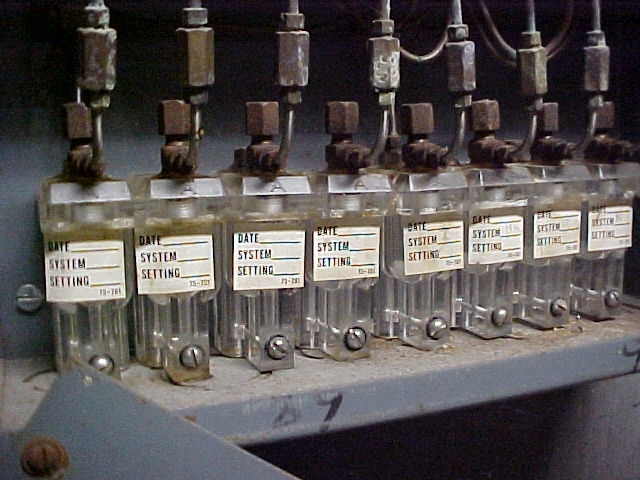 Each of these units contained about 100 milliliters of mercury in a reservoir attached to a U-tube barometer (equivalent to approximately 3 pounds of mercury). The U-tube extends out through the bottom of the controller box (see bottom photo) and may be easily bent and damaged. 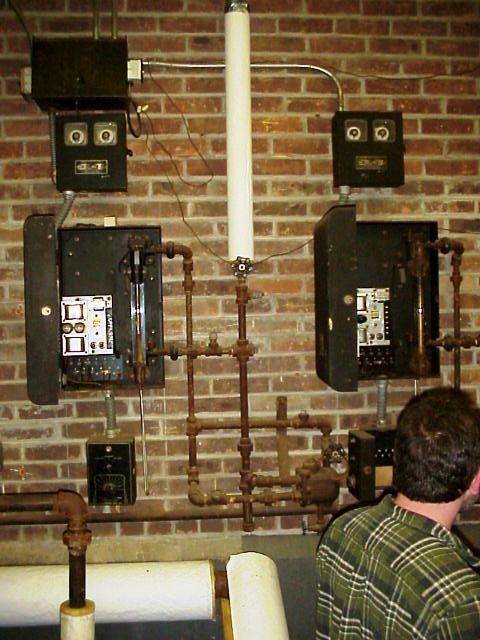 The steam heat controller found at this school was manufactured by Warren Webster & Company in the 1940"s. Research indicates that these units are no longer manufactured, but similar controllers might be present in any building with a steam heating system. Purpose of the Mercury: In the steam heater controllers with mercury barometers, the barometer or "steam gauge" is used to indicate the pressure of the steam supplied to the heating system. A mercury steam gauge is a bent tube partially filled with mercury, with one end connected to the steam supply main line and the other connected to the return steam line. The mercury level in the gauge rises and falls in direct proportion to the pressure difference of the two steam lines. Potential Hazards: The large amount of mercury contained in the barometer or steam gauge, combined with the fact that the U-tube is exposed, creates a high potential for a mercury release or spill. Such a spill would present a significant risk of exposure as well as extensive cleanup costs. Spills greater than one pound of elemental mercury (about two tablespoons) must be reported to the appropriate state environmental agency. If a spill or break occurs, persons should immediately contact their state environmental agency for instructions on proper clean-up and disposal. Persons that have been exposed to a mercury spill should contact the public health department or poison control center. Recycling/Disposal: The mercury steam gauge should be sent to a reclamation facility and recycled. The mercury in the U-tube barometer and any materials used to clean up spilled mercury or any items or pieces of equipment that are contaminated with mercury would need to be disposed of as hazardous waste. Statutes and Other Information: Research indicates that these units are no longer manufactured but may be present in many circa-1930-1940s schools and buildings with steam heating systems, and may be subject to mercury disposal laws.